A shock front increases the pressure and density of the fluid that passes through it. In other words, the front compresses the flow. 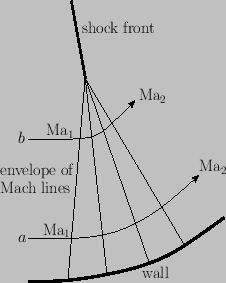 A simple method for compressing a supersonic flow is to turn it through an oblique shock, by deflecting the wall through an angle , as shown in Figure 15.6(a). The wall deflection can be subdivided into several segments, which make smaller corners of angle , as shown in Figure 15.6(b). Compression then occurs through successive oblique shocks. These shocks divide the flow field close to the wall into segments of uniform flow. Further out, the shocks must intersect one another, because they are convergent. However, for the present, we shall only consider the flow close to the wall. In this region, each segment of the flow is independent of the following segment. In other words, the flow pattern can be constructed step by step, proceeding downstream. This property of limited upstream influence exists as long as the deflection does not become so large that the flow is rendered subsonic. Hence, if the compression is achieved by means of weak shocks then the net specific entropy increase can be reduced very significantly, compared to that generated by a single shock that produces the same deflection. In fact, the reduction is by a factor of order . Let us now consider what happens to the flow further away from the wall, where the weak shocks and Mach lines of Figure 15.6(b) and Figure 15.6(c), respectively, converge. Consider Figure 15.7. Because of the convergence of the Mach lines, the change from the initial Mach number, , to the final Mach number, , is achieved in a much shorter distance on streamline than on streamline . Thus, the velocity gradients on streamline are higher than those on streamline . Now, an intersection of Mach lines would imply infinitely high velocity gradients, because there would be two different values of the Mach number at a single point. In practice, this does not occur, because, in the region where the Mach lines converge, and before they cross, the velocity gradients become high enough that the conditions are no longer isentropic. In fact, a shock wave develops, as illustrated in the figure. Figure 15.7: Convergence of Mach lines in continuous compression by turning.